Meknès- King Mohammed VI inaugurated, on Monday in Meknès, a youth training center and launched the self-employment and training program on building jobs, giving strong momentum to projects and programs by Mohammed V Foundation for Solidarity in the region. These initiatives, which back the 16th National Solidarity Campaign (November 9-17), confirm, once again, the importance of associations’ action, the youth issue and the unwavering will of the sovereign to secure better socio-vocational integration for youth, mainly from poor families. The youth training center, carried out for 4.5 million dirhams, is aimed at reinforcing the competence of local associations and cooperatives in the Meknès-Tafilalet region. Built over a surface area of 1,613 square meters, the new center seeks to foster the development of associations’ movement through the amelioration of its institutional potentials for a strong, efficient involvement in a sustainable, democratic and integrated development. As for the self-employment and training program on building jobs, it is meant to support initiatives by young graduates of vocational training centers, promote self-employment, and combat joblessness. The program, which spans three years (2013-2016), will be carried out in three phases and will concern the Meknès-Tafilalet region (1st phase), the Greater Casablanca and Fez-Boulemane. The first phase is worth 6.227 million dirhams and is expected to benefit 100 graduates specializing in the building sector (carpentry-aluminum, electrical wiring, paintwork, plumbing, masonry, wooden carpentry, metal fittings, plaster works..) with a self-integration project. 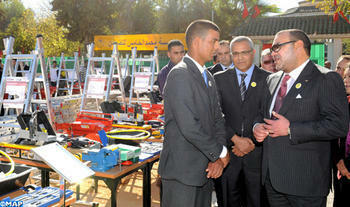 On this occasion, the King handed building equipment for the benefit of 100 young graduates selected from the provinces of Errachidia, Khénifra, Midelt and the Meknès prefecture as part of the first phase of the said program.